HOURS: Monday - Saturday 10 a.m. to 10 p.m. | Sunday 11 a.m. to 10 p.m.
We offer a wide variety of pizzas, subs, wraps, salads, stromboli, calzones and homemade pasta dishes. We also cater! 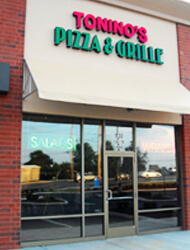 Call or fax to order ahead or walk in to enjoy our large selection of regular and gourmet slices and other delicious salad and sandwich options that can be ready to enjoy in minutes. We deliver to businesses only, with a $20 minimum purchase.